Many important metals are traded on public exchanges. Among these exchanges are the New York Mercantile Commodity Exchange (COMEX) and London Metal Exchange (LME). Other metals are bought and sold directly through the offices of metal producers using prices set by those producers or related trade associations. Less common metals or those with specialized uses may not be publicly traded at all, but require direct and private agreements with the metal producer. For popular metals, many markets offer futures and options contracts which allow market participants to reduce potential volatility in the price of their metal supply. These instruments also give speculators the opportunity to profit from unpredicted price swings and volatility in metal markets. Outside of specialized commodity markets, many investment firms and equity markets offer retail invetors the opportunity to participate in metal investing and price speculation through specialized instruments such as EFT's (Exchange Traded Funds). EFT's are available for most all of the important industrial, base and precious metals. Some of the more complex metal price EFT's are designed to track the inverse of a metal's price or even multiples of the market price. 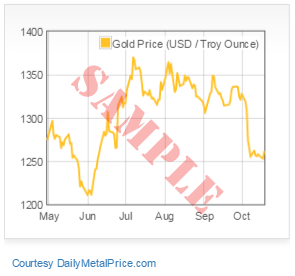 Other EFT's track the price of an individual metal or a group of metals. Investors also participate in metal price speculation through investment in mining companies and funds that invest in mining firms. 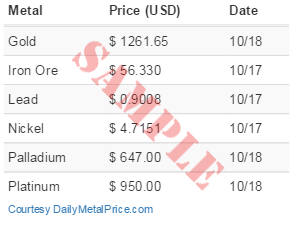 Our prices are daily "spot" prices are gathered from a variety of public sources and offer a daily snapshot of a particular metal's price.